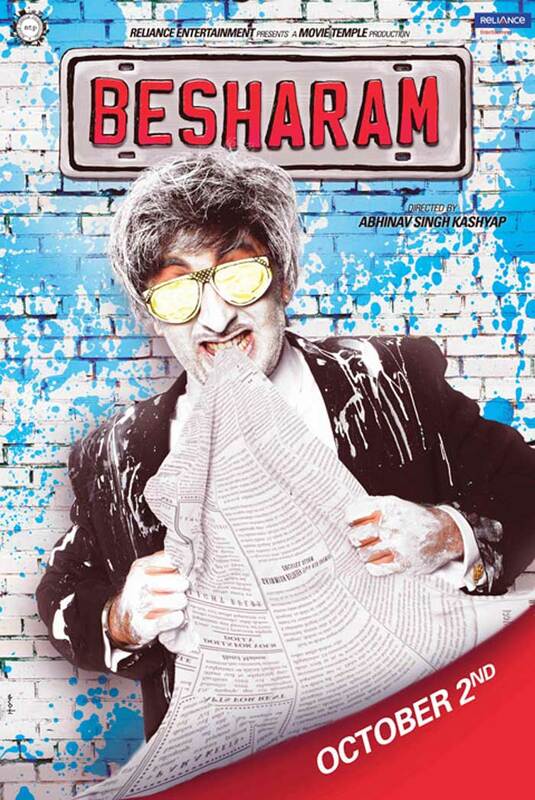 BesHaraM- A cringe worthy film which tests the extent of your tolerance!!!! When was the last time you came out of a Ranbir Kapoor film feeling cheated? For many, the answer would be never. For me, the only unwatchable film in his body of work is Ajab Prem Ki Ghazab Kahaani….That was, till I watched Besharam!!!! I am no one to debate on the man’s talents, clearly in a span of 6 years, he has transformed into a true blue superstar who has built up a reputation of taking up the most challenging roles and dishing out performances we take home with us and he in turn has been taking home the best actor awards every year. But the juggernaut had to end some where and clearly the buck stops here. Ever since I had watched the first promo of this film, I had braced myself up for a rip roaring comedy which would have fresh, peppy music and a solid quota of dishoom dishoom and add to that, the whole Kapoor khandaan package was like a sone pe suhaga. But then, the music released and the seeds of doubts were sown right there. After giving us one chart buster after another, here was a Ranbir kapoor soundtrack which did not boast of a SINGLE groovy track. Not just that, the music harped back to a different era altogether and it was then I decided to not except too much from this film. 10 laughs and a couple of terrific performances was all i went in expecting. Alas, I came out not even laughing once during the film although the kapoor scion did deliver a rock solid performance. Sadly, the script failed him big time. The story is about an orphan who grows up to be a car thief. He is the best in the business and is very kicked with his life until he falls in love. And thus begins the road to redemption. Its that simple really. There is nothing more to the story beyond this. Add to this a childless police couple who want to retire rich. Throw in a villain who has a permanent scowl on his face. Every character has been designed in such a manner that in their zaniness, in their madness, you will find relief and fun. Alas, what you end up getting is a film which is so obnoxious that you really double check the director’s pedigree and realize the fact that YES, he is Anurag Kashyap’s brother. Abhinav kashyap who gave us such an iconic character in Chulbul pandey manages to come up with a hero called Babli. Is that even remotely funny? Naah. Shot amidst the hustle and bustle of Dilli and Chandigarh, the film spends its first half showing us how sweet and good hearted Ranbir’s Babli is beneath that naughty exterior. And in the second half, it makes him fall in love. In the middle of all that, there is truck loads of Potty humour (Literally) and scenes which make you squirm in your seat. I mean who puts a sock in his underwear? I mean I am a big fan of masala films, but the fact is that they should entertain. Besharam clearly forgot that part and the writers came up with a story which did not even deserve to be made as a B film. How then did Abhinav kashyap manage to get stars of the ilk of Ranbir and Rishi Kapoor on board is still a baffling mystery to me. Ranbir kapoor once again delivers a superlative performance, but there is only this much he can do with such a shoddy script. Rishi kapoor lightens up the screen every time he appears and his final outburst ala Sunny Deol is too Rohit Shetty in attempt but is fun all the same. The ladies in the film are the ones who further contribute in making Besharam a boring and sorry affair. Pallavi Sharda seen earlier in a two scene cameo in Love Breakups Zindagi has just two expressions in her repertoire and she still doesn’t know which one to use when. Terribly miscast. Neetu Singh is too loud and delivers a one note performance. The music is horrible and the fact that after every 15 mins, a song pops up doesnt really help. The songs are right out of a 90’s film and clearly the famous Jatin-Lalit are incomplete without each other. lalit pandit here is the one to be blamed. The camera work is adequate and captures every frame beautifully. The script as mentioned before is absoultely crassy. But it is the director Abhinav kashyap who dissapoints me the most. After a genre breaking Dabanng, he takes 3 years to pen such a terrible film. No doubt, the star power of Ranbir kapoor will fetch this film a thunderous start, but with the kind of content this film has, it wouldn’t even come close to the heights Yeh Jawani…had attained collections wise. Unless our gud ol junta takes a liking to this screwed up film. After all, last month we had another puerile release called Grand Masti which has emerged a blockbuster. But die hard Ranbir fans, get ready to pluck your hair out of desperation.